An international three-man crew onboard a Russian-made Soyuz capsule touched down successfully on the cloudless central Kazakhstan steppe Monday morning after 123 days at the International Space Station. A fleet of Russian Mi-8 helicopters deployed from towns near the landing site ahead of the capsule's arrival early Monday morning to ensure swift interception. NASA's Joe Acaba and Russian colleagues Gennady Padalka and Sergei Revin undocked from the orbiting laboratory somewhere over Nairobi, Kenya, some 3 ½ hours before touchdown. The Soyuz craft remains the only means for international astronauts to reach the space station since the decommissioning of the U.S. Shuttle fleet in 2011. The size of the three-person complement currently at the space station will be doubled when they are joined next month by U.S. astronaut Kevin Ford and Russians Oleg Novitsky and Yevgeny Tarelkin. NASA's Sunita Williams took over command at the station Saturday from Padalka, becoming the second woman in history to do so. Williams, veteran Russian cosmonaut Yuri Malenchenko and Aki Hoshide of Japan are due to return to Earth in the middle of November. 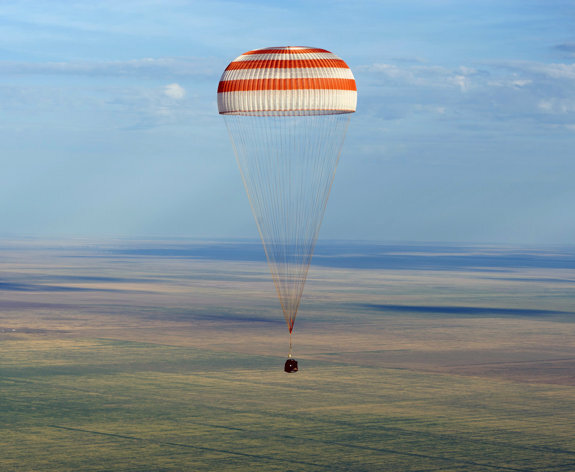 Padalka, who piloted the Soyuz craft back to Earth, was the first to be pulled out of the capsule, which rolled onto its side after coming down softly in the flat Kazakh countryside some 85 kilometers (50 miles) north of the town of Arkalyk. Upon their return, astronauts are typically lifted onto reclining chairs to ensure comfortable acclimatization after months of living in gravity-free conditions. Looking relaxed and smiling broadly while sipping a mug of tea and basking in the mild sunny conditions, Padalka waved at cameras that descended on the site soon almost immediately after landing. "We honestly could not have asked for better weather out here today. The temperature's really good (and) the crew is obviously enjoying this weather," NASA spokesman Josh Byerly said in an online link-up from the landing site. "I have never seen the amount of clarity we had today." With this mission complete, Padalka becomes the fourth most seasoned space traveler, having spent 711 days in space over four missions. "I feel great," Padalka told attending recovery staff, before thanking colleagues for their assistance in his mission. Acaba, who followed Revin out of the prone Soyuz capsule, gave the thumbs up sign as he was being lifted to his reclining chair and said: "It's good to be home." In an uncustomary gesture, the astronauts signed their names on the capsule, which is due to be displayed at the Tsiolkovsky Museum in the town of Kaluga, southwest of Moscow. The precision of the landing enabled a Russian recovery crew in all-terrain vehicles to reach the capsule within seconds of touchdown. Astronauts were given immediate medical attention and then shortly afterward transported by helicopter to a forward base in the Kazakh city of Kostanai, from where they were to begin their trip home. Russia has suffered a series of blows to its space prestige in recent months with a string of failed launches, provoking some anxiety about what some observers believe to be excess U.S. reliance on the Soyuz program. In August, a Russian booster rocket failed to place two communications satellites into target orbits, stranding the Russian Express MD-2 and Indonesia's Telkom-3 satellites in a low orbit where they could not be recovered. A Russian robotic probe designed to study a moon of Mars got stranded in Earth's orbit after its launch in November and eventually came crashing down in January. A few months before, a Soyuz booster rocket similar to those ferrying crews and cargo to the International Space Station failed, prompting officials to consider leaving the space outpost unmanned. Please note that we are not able to publish all the comments that we receive, and that we may edit some comments to ensure their suitability for publishing. Feedback will be rejected if it does not add to a debate, or is a purely personal attack, or is offensive, repetitious, illegal or meaningless, or contains clear errors of fact. Although we try to run feedback just as it is received, we reserve the right to edit or delete any and all material. * Publication permit No. 378/GP - BTTTT Hanoi, September 16, 2013.